Free Printable Quotes Bookmarks | Print, Cut, Paste, Craft! Today I was doodling while my kids were happily bouncing around in one of those awesome bouncy house places we love to go to in the winter. 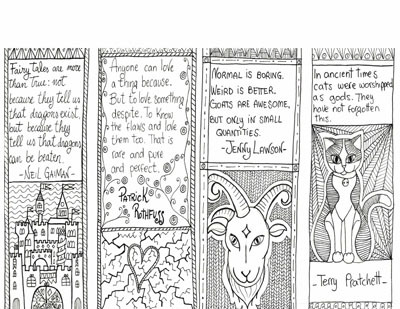 The doodling resulted in these four bookmarks with quotes by four of my favorite authors: Neil Gaiman, Patrick Rothfuss, Terry Pratchett and Jenny Lawson a.ka. The Bloggess. I liked them so much that I thought I would share them so you can print them and color them if you like. Click here (not on the image!) for the hi-resolution version of the bookmarks. Is there any quote you would like to see as a bookmark? Let me know and if I like it enough I might create one and post it!